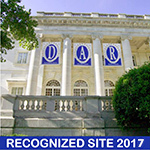 The National Society Daughters of the American Revolution (NSDAR or DAR) is a non-profit, non-political, volunteer women's service organization. The Revolutionary Dames Chapter NSDAR was organized October 8, 1908, in Waverly, Iowa. The name, Revolutionary Dames, was selected by the chapter as being stately, dignified, and indicative of our being descendants of the patriots of the American Revolutionary War. In June 1854, at the time of an Indian uprising near Spirit Lake, Iowa, Old Fort Barrick was built by early settlers and John T. Barrick who was the founder of the town of Janesville. Fort Barrick's name was later changed to Fort John, and the town of Janesville was named in honor of John Barrick's wife, Jane. The site was marked by the Revolutionary Dames Chapter on June 21, 1913. The inscription is: "This marks the site of Fort John built by the early settlers at the time of the Indian scare June 1854." The marker is located in Janesville, Iowa. From Waverly, drive 5 miles south on U.S. Highway 218. Take the first exit and then turn right. Go west to Main Street and then turn left. The marker is on a native boulder at the site of the old fort just north of the post office at 226 Main Street.